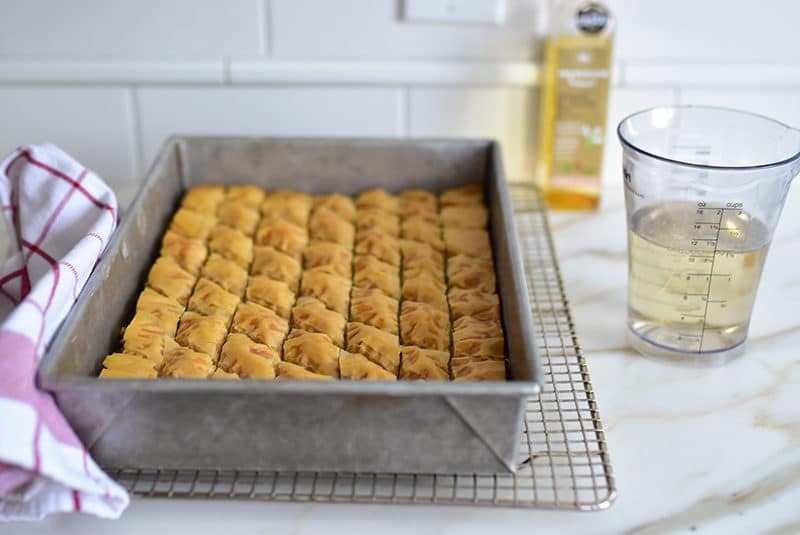 Olive oil baklawa is a fabulous alternative to classic baklawa, or baklava — the Mediterranean pastry traditionally drenched in butter and flower water syrup. How exciting to have a vegan baklawa (vegan baklava) option that tastes so very good! I won’t say that olive oil baklawa tastes exactly the same as if you’ve made your baklawa with clarified (and in my case, cultured) butter. This is not one of those efforts to say that substituting an essential ingredient in a beloved recipe yields the same result. Not gonna happen. What I will say, with glee, is that baklawa—that pan-Mediterranean pastry of phyllo, nuts, flower water syrup or honey, and butter—made with oil rather than butter is still . . . baklawa. And still . . . absolutely delicious! My favorites of the oils for baklawa are the olive oil and the coconut oil. I really wanted the olive oil to work, since olive oil seems like such a natural companion to any Mediterranean recipe. So it’s a thrill to discover that yes, tastes wonderful. The coconut oil is so delicious too, and it does impart coconut flavor, which is unexpectedly great with the other flavors at play (the flower water syrup, the nuts, the phyllo). How much easier these oils are to use than butter, which has to be clarified. Yes, you can buy butter already clarified, but it’s a pricey deal. Admittedly, I keep a 5 lb. tub of clarified Plugra, restaurant-style, in my pantry. But lasts me long, I promise. My inspiration to make the baklawa with oil came from many of you, who have asked if a vegan baklawa is possible, and if it would taste good. You also inspired my nut-free baklawa recipe, which my cousin Holly and her husband Vivek schooled me on last year (made with a combination of seeds rather than the traditional walnuts, pistachios, or almonds). Turns out nut-free baklawa is fabulous. 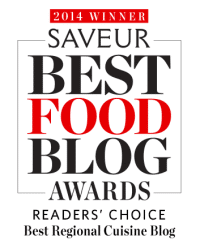 Now we’re adding the butter-free to the same ranks: fabulous!, and here we give our vegan friends the chance to enjoy. Even the butter-eating rest of us might like to go for a healthier fat in our baklawa now and then, given that it’s so delicious. I hope this vegan, no-butter baklawa makes a difference for everyone who doesn’t eat butter. But even those of us who do might find ourselves turning to baklawa made this way, with a good oil, for the fun and flavor of it. 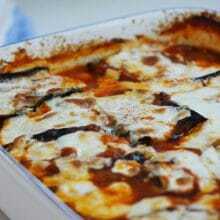 The olive oil can be substituted with melted coconut oil. My method, taught to me by my clever Aunt Rita, calls for pouring the oil over the assembled, cut layers of phyllo and nuts. You can absolutely brush each layer of phyllo with the oil as is traditional instead if you like. Be sure to thaw the phyllo overnight in the refrigerator, then bring to room temperature for a couple of hours before working with it. Athens phyllo, my favorite, is found in most grocery stores in the freezer section. 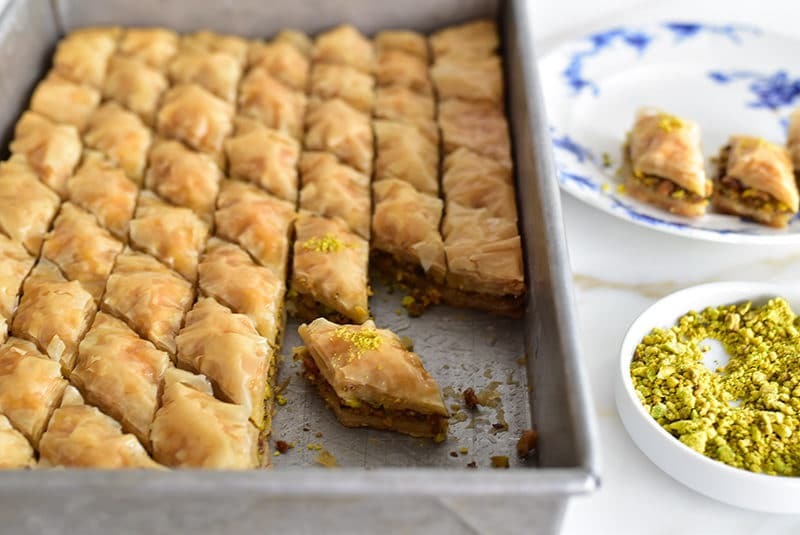 Note that this is the same recipe I use for baklawa in my cookbook and elsewhere on my site, but I've reduced the oil amount by just a touch here. 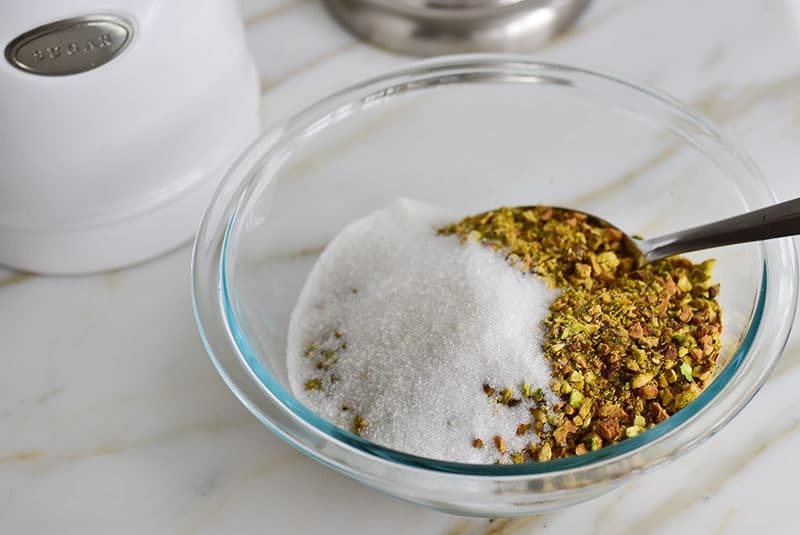 Raw pistachios, finely chopped, make for a brighter green garnish if you like, or simply save a few tablespoons of the ground pistachios from the bowl. Try my nut-free baklawa recipe here. Read more how-to tips for baklawa here. Make the syrup in advance so it can be fully chilled. 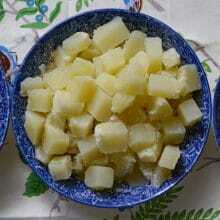 In a small saucepan, combine sugar, water and lemon juice and bring to a boil over medium high heat. Reduce heat to medium low and simmer for 5 minutes. Add the orange blossom water. Pour into another, heatproof, container and cool completely. It is essential to pour cool/room temperature syrup over the hot pastry when it comes out of the oven. Make the sugared nuts: The nuts are ideally ground in a hand grinder, but they can be coarsely chopped in the food processor using pulses, taking care not to go too far. Some nut-dust is unavoidable, but it is better to have a few nuts that need to be broken by hand than to process too much, which will produce nuts that are too finely chopped. Set aside a few tablespoons of the ground nuts to top the baklawa as a garnish. Combine the chopped pistachios and sugar, stirring until all of the nuts are coated. Preheat the oven to 350 F and assemble the baklawa. Open one sleeve of the phyllo and unroll it on top of the plastic it is packaged in. Keep the phyllo covered with a towel. 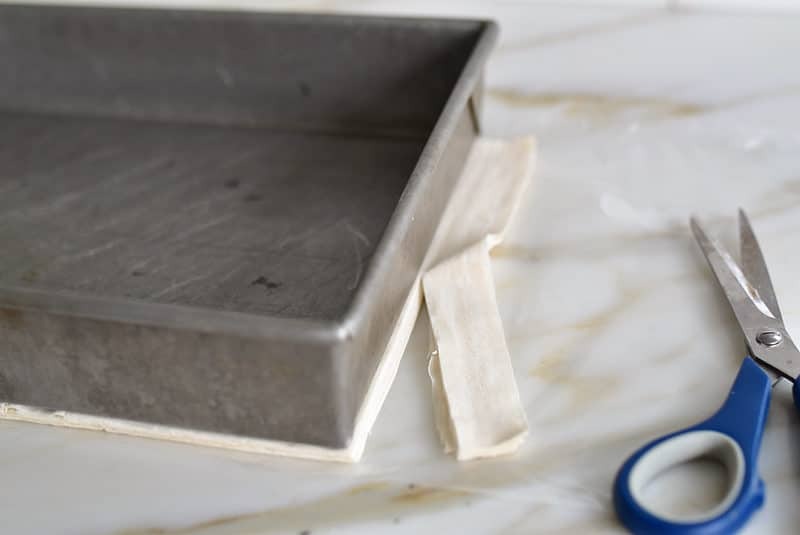 Using a metal 13 x 9 x 2-inch metal pan, lay the panover the stack of phyllo to fit. Cut about an inch off of the short side of the phyllo stack so it will fit in the pan. It’s better to leave the phyllo just a hair larger than the pan because it will shrink when it bakes. Brush the bottom of the pan with olive oil. Lay one stack of phyllo leaves in the pan. Spread the nuts over the phyllo in an even layer. Open the second sleeve of phyllo and trim the same way as the first sleeve. Lay the second stack of leaves over the nuts, taking care that the top layer is a sheet that is not torn. Take a layer from the center of the leaves for the top layer if necessary. Brush the top layer or two with olive oil to make the cutting a little easier. Using the tip of a very sharp chef’s knife, cut the baklawa into diamonds by cutting six rows (5 cuts) lengthwise and ten rows (9 cuts) crosswise on the diagonal. For slightly smaller pieces, cut 7 rows (6 cuts) lengthwise. Lightly score the top with your knife before diving in so you can see where the cuts will be. Use your dominant hand to cut and the other hand to hold the top layers of phyllo down while cutting, and be sure to cut all the way through to the bottom of the pan. This is essential so that the oil will seep through all layers. The knife is held almost perpendicular to the pastry, cutting straight down into the phyllo and nuts. The top layer will lift and in general make you want to curse as you cut, but just lay the phyllo back down where it belongs and move on. The sharper your knife, the easier the cutting will be. 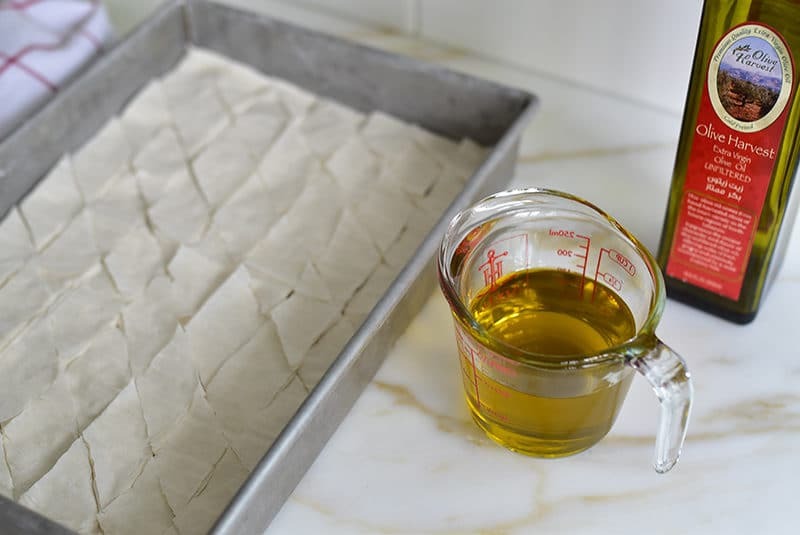 Pour the olive oil over the cut baklawa evenly. Allow the oil to settle in, about 5 minutes. Bake on an oven rack second from the top until deep golden brown, 50-60 minutes, rotating the baklawa halfway through baking. Remove the pan from the oven and without waiting even a minute, immediately pour the chilled orange blossom syrup evenly over the hot baklawa. Listen for the sizzle! When the pastry is just cool enough to handle, cut away a few pieces of the uneven edge morsels to eat warm (the baker's reward...). Let the baklawa cool for several hours. Cut the pieces of baklawa from the pan with a sharp knife as needed. Top each piece with a pinch of chopped pistachios. Serve in foil mini-muffin cups or directly on a plate, arranged in a circle with the points of the pieces facing the center. Keep the baklawa lightly, not tightly, covered in the pan with plastic wrap or a piece of wax paper for up to 2 weeks. 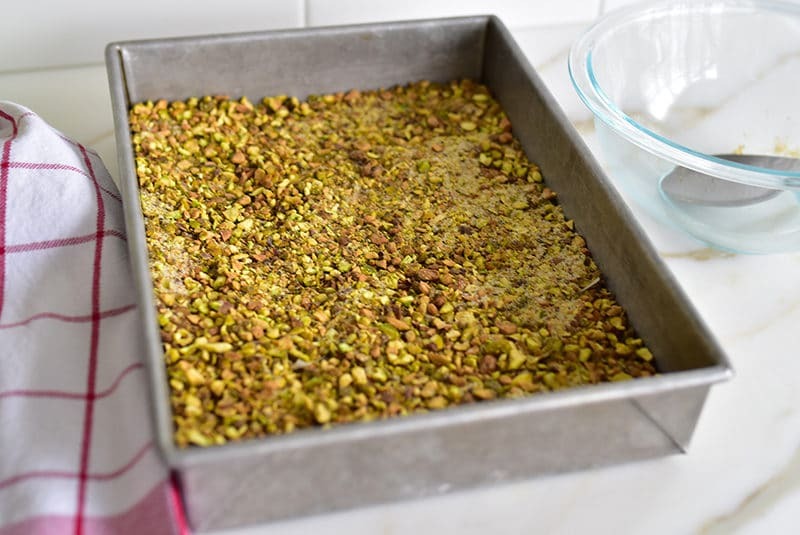 5 Responses to "Olive Oil Baklawa with Pistachios"
Thank you so very much for this recipe. 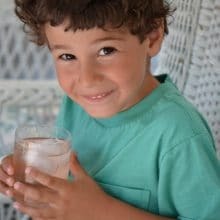 My son loved Baklawa as a child but has been vegan for over 10years . I have sent this recipe to him. I am sure he will make this for Christmas. As for me I make the original at Easter and Christmas and sometimes for summer parties (it is often requested ). Thank you for all you recipes throughout the year . I refer to your book to enhance my cooking that I learned from my mother-in-law many years ago. Wishing you and your family a Blessed Christmas and a Happy Healthy New Year! Susan, I’m so happy to know this recipe is going to be great for your son! Thanks so much for your kind words too. I send warmest regards to you and yours for a Blessed Christmas and New Year! At what temperature do you bake the Baklawa? Bake at 350! But you can bake at a bit lower or higher as long as you keep a close eye on it!